At the beginning of January, I traveled to Mexico’s Pacific coast with a group of veterinarians, veterinary technicians, and vet tech students from Massachusetts, New Hampshire, Michigan, Canada, and fourth year vet students from Michigan State University to perform a week long spay/neuter clinic for the locals’ pets. This volunteer organization is called the Mazunte Project, and it was founded 19 years ago by Dr. Rich Rodger of Massachusetts and Dr. Marcelino Lopez of Mexico. The goal of the Mazunte Project is to increase sea turtle populations by decreasing the population of dogs that roam the beaches and eat sea turtle hatchlings and eggs. In addition to spay/neuter work, the Mazunte Project partners with the Palmarito Sea Turtle Rescue organization of Mexico that monitors and protects vital leatherback, olive ridley, and green sea turtle nests of Puerto Escondido, Mexico. 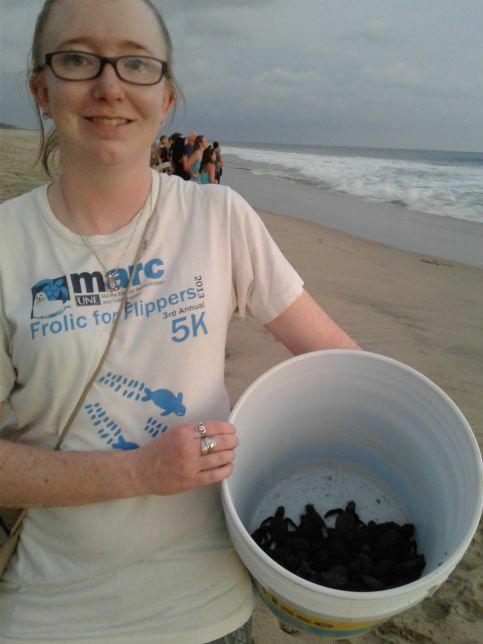 Jessica holding a bucket of olive ridley sea turtles that are waiting to be released on the beach. This year 698 surgeries were performed by the group, a record setting number for the Mazunte Project. That’s 698 dogs and cats that will live healthier lives because they are no longer intact. Those animals won’t be driven to the beach by the hunger of pregnancy and lactation, and a generation of animals that could have destroyed sea turtle nests was prevented. The days of surgery were long, hard, and hot near the tropical beaches of Mexico. But they were also incredibly rewarding, gratifying, and fun. Our teams quickly bonded while we worked to set up our mobile induction, surgery, and recovery areas and perform as many as 30 surgeries a day before the sun went down. 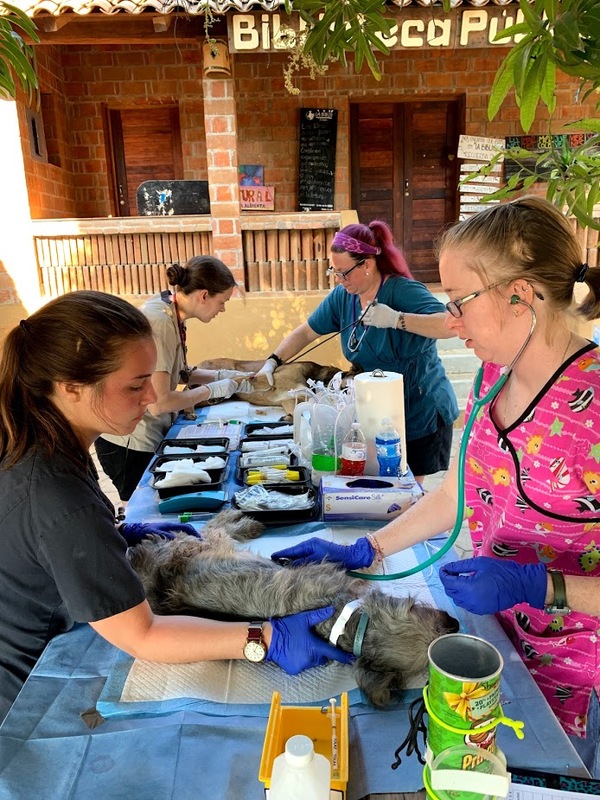 We may not have had the equipment and conveniences of the modern veterinary clinics most of us are used to working in, but the medical care and the compassion we provided to each patient was top notch. Front left: Brianna Kinley Farber (4th year Becker College student), Front right: Jessica McMurrer, Back Left: Danielle Rose (veterinary technician from Michigan), Back Right: Jennifer Buhler (veterinary technician from MA). Our reward for a week of hard work and record number of surgeries was the opportunity to release a nest of olive ridley sea turtle hatchlings that Dr. Lopez had found the night before. We lined up the hatchlings along the shore at sunset and protected them from seabirds so they could make their journey to the ocean. It was a truly incredible experience that brought the conservation goals of the Mazunte Project full circle. Only about 1 in every 1,000 sea turtle hatchlings will reach adulthood, so helping them avoid predators while they enter the ocean is one small step to increase those odds. I encourage all vet techs to participate in a volunteer project. You each have valuable skills that are needed to improve the lives of animals, people, and maybe even help wildlife and ecosystems. It is also an opportunity to learn new skills and refresh those you might not use regularly. Contact Dr. Rich Rodger at [email protected] if you are interested in participating in next year’s trip or if your vet clinic can donate supplies. You can also contact me at [email protected] if you would like to hear more about my experience. Please visit www.palmaritoseaturtlerescue.org to learn more about the sea turtle conservation efforts happening in Mexico and to make a donation. Consider applying for a grant from the Massachusetts Veterinary Technician Association to help finance your volunteer veterinary project.